Trains carrying oil can pose serious risks to public safety and the environment, and California isn't prepared, according to a report released by state agencies this week. Crude-by-rail is a growing concern, as an oil boom in North Dakota has meant increasing amounts of crude traveling to refineries by rail. A series of fiery derailments in the past year, including one that killed 47 people in a Quebec town, has focused attention on the need to prevent accidents and be prepared for emergency response. The report warns that a derailment in California could kill people, destroy neighborhoods, damage water supplies and threaten natural areas. "Even though we haven't had an accident, which is great, we want to be able to respond to it when there is an accident," said Kelly Huston, a deputy director at the Governor's Office of Emergency Services (OES). "With the increase in the amount of crude oil on rail coming through California's cities and counties, we believe there should be some increased training for first responders." The report was released by an inter-agency group that includes the OES, the state Department of Fish and Wildlife and the California Public Utilities Commission (CPUC), among others. It recommends boosting funding for emergency responder training, and for equipment to handle hazardous material accidents. It also supports an item in Governor Jerry Brown's proposed budget that would provide more money to the Office of Oil Spill Prevention and Response, which has focused on marine oil spills in the past, but is now preparing for the possibility of inland spills. It's not all about accident response; there are also recommendations for prevention. Most rail regulation is up to the federal government; the CPUC helps enforce safety rules with its own rail inspectors. There are 52 of them, responsible for monitoring more than 5,400 miles of track in the state. "This staffing level is seriously inadequate," the report says. Paul King, deputy director for the rail safety at the CPUC, said the Governor's budget aims to help. "To meet the volume of trains and the magnitude of the risk that [crude-by-rail] presents," King said, "the Governor has put in his budget for extra staffing." There are other gaps the state cannot fill alone. As the CPUC pointed out in a report released last year, there is only one federal railroad bridge inspector for 11 Western states. The report also raised the need for more information. As of last weekend, railroads that are transporting large shipments of Bakken, the volatile crude oil from North Dakota, must notify states. Huston of the OES said he got the first batch of documents Monday, but he said they're of limited use and not timely enough. He said the OES is following up with BNSF and the federal Department of Transportation, the agency that issued the notification order. Huston said he'd also like to see a map that the public could access, showing where the oil train shipments are headed. The railroads are resisting releasing information about crude shipments to the public. Most of California's oil comes either from within the state or overseas, and travels to refineries here by pipeline or ship. And that's still the case. 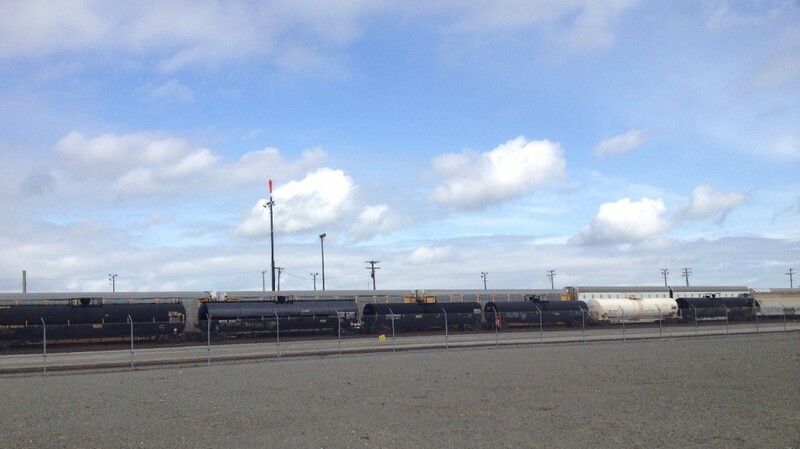 According the the California Energy Commission, only about one percent of California's crude came by train in 2013. But trains carrying oil are becoming more frequent, and the CEC projects that by 2016, trains could be bringing in about 23 percent of California's crude.